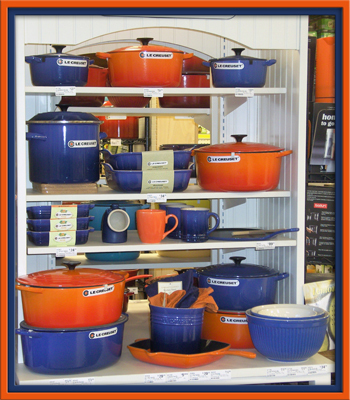 Le Creuset was founded in 1925 in the town of Fresnoy-le-Grand in Northern France by two Belgian industrialists - Armand Desaegher (a casting specialist) and Octave Aubecq (an enameling specialist). The pair introduced the signature Le Creuset round cocotte (French/Dutch Oven) soon after; the cocotte remains the company's most popular cookware piece to this day. To create their cast iron cookware, the Le Creuset foundry uses standard sand casting methods. After hand finishing, items are sprayed with two coats of enamel, each fired at 800 °C. The enamel becomes resistant to damage during normal use. Currently, all Le Creuset cast iron cookware is still manufactured in the company's foundry in Fresnoy-le-Grand, where artisans employ a 12 step finishing process implemented by 15 different pairs of hands to ensure that there are no flaws or imperfections in the final product. French/Dutch ovens are particularly useful for cassoulet, and other long-baking stews such as chili con carne, cholent, and bouillabaisse. The company does not recommend using them for deep frying or making an oil-based roux (as for gumbo), because some oils can become hot enough to damage the enamel. Le Creuset enameled cast iron can be used on all cooking surfaces, including electric, gas, glass halogen and induction cookers. It can also be used for food storage (in the refrigerator) and in the oven. The most exciting changes at May Hardware have occurred recently in the Housewares department. Formerly a rather dull, old fashioned kitchen supply area, this department has undergone a fantastic rebirth. 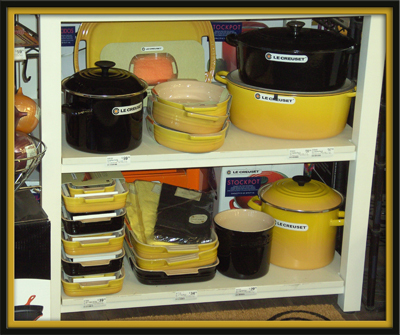 Headlined by Le Creuset cookware & utensils, the department has a definite European feel. The all new and expanded kitchen shop at May Hardware is a must see. Ladies - a great shopping stop while he is getting those parts for his workshop! !